It's not secret we like the Butler Family YMCA and The Wheel Mill. From the top down both have not just tolerated unicycling, but welcomed it in their facilities. 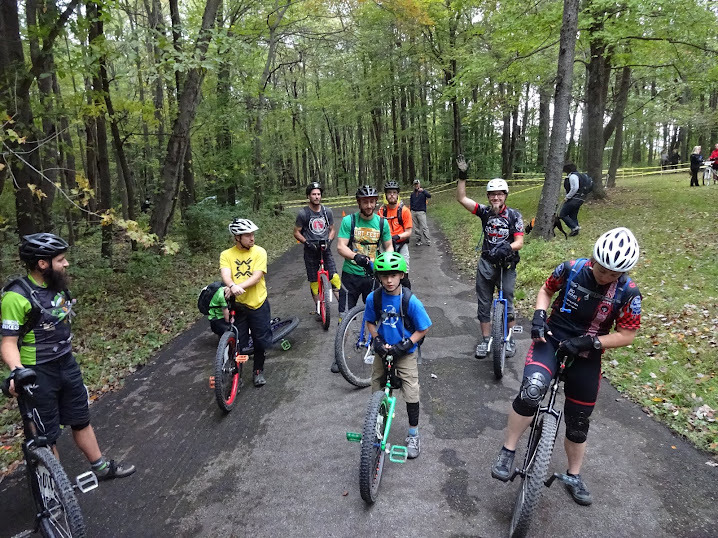 It's been a bit of a paradigm shift for some to see unicycles as not just clowns, juggling, and the circus (although there's nothing wrong with those things), but rather an activity that people of all ages and abilities can enjoy. The Butler Wobble was founded on the principle that unicycling is fun and you should do it. It can be incredibly athletic if you want it to. You can enjoy a cruise around the neighborhood or local rail trail or you can enter charity events and races populated with bikes. We've tried to keep an open mind to what those who join us to ride want to do so we end up in many places with our unicycles- including some parades and basic demonstrations. But what most of us who are heavily involved in the Butler Wobble like to do is ride unicycles for sport. The YMCA has and will always be a vital part of what we do. Teaching people to ride is essential. However, that's not the end. We've been spending a lot of time since the beginning of Summer at The Wheel Mill honing our skills, gaining confidence, and pushing each other to ride better over bumps, ramps, skinnies, and drops. We've had the opportunity to meet other riders whom we might have not met otherwise. It's been a complete win for us. Now, it's our chance to get involved as The Wheel Mill moves forward. They're looking to build a pump track, but need funds to do so. Follow this link to find out more. While a pump track will be of a bit of use to unis (but admittedly much more so for bikes), it allows The Wheel Mill to build ridership to generate capital to build more areas that we ALL can enjoy. The planned new beginner area is really exciting for beginner to intermediate unicyclists looking to improve their skills. There are other plans for more advanced features that we can't even talk officially about too. We are excited about the prospects of The Wheel Mill moving forward. We ride there. We don't profit financially should you choose to contribute to the campaign. We do benefit, like everybody else does in the region, from an indoor pedal park where we can ride throughout the dark and cold days of Winter. And, should you want to try unicycling for yourself you can find us there every other Friday (the odd days) in October and most every Friday after that throughout the Winter. If you want to learn to ride, we can teach you. If you want to try a uni, there are two Trials unis and two 24" Munis that live there and are available to use for FREE (with paid admission). We don't ask you give up biking. We do ask you try unicycling.